Clarets boss Sean Dyche was pleased with the number of chances his side made as they claimed a fifth home win of the season at the expense of Bournemouth. Jeff Hendrick scored a glorious volley to set Burnley on their way, before Republic of Ireland teammate Stephen Ward converted a second from close range. Benik Afobe pulled one back right on half-time, but George Boyd drilled in a third, with Charlie Daniels' late goal a consolation for the Cherries. 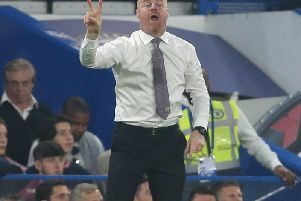 The win means Dyche has more home wins in the Premier League this season than Pep Guardiola and Jose Mourinho put together, with five - one more than the whole of Burnley's last season at this level. The Clarets also have more home goals already than in 2014/15, and Dyche said: "I think the key for us was to have a fast start and a good start because they've just come off the back of a really big result, and they're going along nicely - I think they're a really good side and Eddie (Howe)'s done a great job there. "We knew we'd have to play well, and apart from a middle period, I thought we did. "We started bright and scored a fantastic goal, certainly worthy of the Premier League. it's just a shame we're not Arsenal because it would be shown a thousand times instead of maybe four. "Then we reacted quickly with a set piece, and credit to them, 2-0 down, they seemed to rise from that, that freedom came back to their game, which can happen as we've found. "They looked more clear-minded, kept the ball, kept shifting it, but we stayed resolute with the shape, and I don't think they created too many golden chances. "Then, a frustrating one at half-time - I don't know where the time comes from. They tell you it's a minute and then they score one minute 17, but they come in and the game feels different. "They started the second half really well and then I was super pleased with the substitutions, I thought they had a massive changing factor in the way the second half played out." Andre Gray and Ashley Barnes came on for Sam Vokes and Steven Defour early in the second half, and changed the momentum of the game, with Bournemouth pushing for an equaliser, and Dyche explained his changes: "The hardest thing about making substitutions is not waiting for something to happen, I just felt they were getting more territory from shifting it with the pace they have, trying to play longer, and once they got there, playing shorter. "We couldn't really break it as well, and with brining Andre's pace and Barnesy's awkwardness, I thought that had a big effect because the game started swinging back to us and calming down. "We then made two or three golden chances - anywhere else it's a goal with Andre, Barnesy had a little header, and Scotty's is a golden chance as well - the game could have been done a bit earlier. "It's not, and then they score late on and it's a bit nervy in the stadium for obvious reasons - it's had getting wins in the Premier League. "I was really pleased with the amount of chances, and good chances we made, it's harder away - we know that, and the chance count hasn't been good, but the quality of chances were good and overall I felt we deserved it." Dyche also praised Bournemouth, who he feels are a good example for Burnley to follow: "I thought they gave a great reaction, they're a good side. They're kind of a year in front of our group in the sense that their players have been on a similar journey, been with the club a while, and they've matured from last season, they're a bit more calm and have that feel about them - I think that will come with my group, it's part of learning through the Premier League season, and while you're doing that, you have to win games as well. "They're not doing bad bringing Jack Wilshere on as a sub!"